Catholic Primary Schools in Australia are funded in four ways: Federal Government Grants, State Government Grants, school fees and community fund raising. Successive Australian governments have demonstrated a belief that parents’ choice of schooling, including schooling based on the Catholic religious and education tradition, is a right deserving of government support. They have demonstrated a belief that all children have the right to share equitably in public expenditure in education, and a commitment to the provision of adequate and appropriate resources to all schools. However, even when parent contributions are taken into account, on average, Catholic schools operate at a resourcing level of 87% of that of government schools. As there is a shortfall between the costs of running a school and the amount funded by Governments, a reasonable fee structure is necessary for Catholic schools to operate and provide quality learning environments. Catholic schools strive to keep fees as low as possible to remain accessible to all who seek their values. The cost of a Catholic Education is made up of a Tuition Fee which is set by Catholic Education Services a as well as Levies which are set by the school. Fees and levies are invoiced to each family at the commencement of each term. Fees can be paid on a weekly, fortnightly, monthly or term basis according to your preference. A direct debit facility is also available. 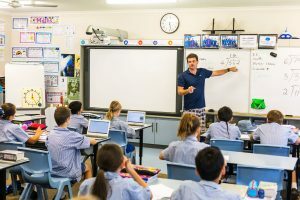 Fees and levies are kept as affordable as possible at about $30 per week for one student, with substantial concessions for families with more than one child attending a Catholic school in the Diocese of Cairns. Detailed information about the cost of fees and levies and concessions applicable to your family are available from the school office. In comparison with other non-government schools and Catholic schools ‘down south’, parents are quite often pleasantly surprised at the affordability of Catholic Education in the Cairns Diocese, especially if they are accustomed to paying childcare costs. However, in keeping with Gospel values, no family seeking a Catholic education for their child is denied on the grounds of genuine financial hardship. Families in these circumstances are encouraged to arrange an interview with the Principal to confidentially discuss fee concessions. For more information on Fees and Discounts and the relevant forms, visit the Catholic Education website.